Pack of 4 microfiber cleaning barrels - change approximately every 500 LP'S. 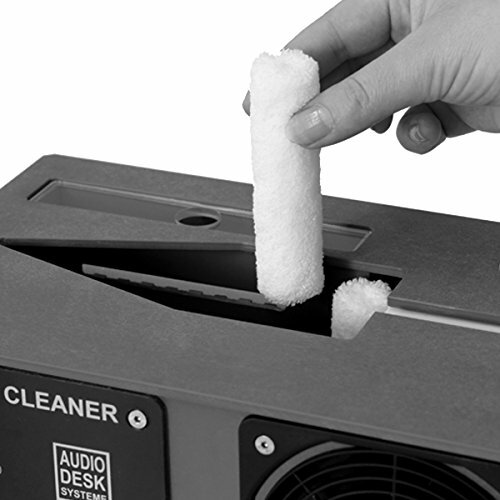 Specifically developed for use with the Audio Desk Systeme Vinyl Cleaner's ultrasonic cleaning action. The Audio Desk Systeme Vinyl Cleaner is the first and only record cleaning machine that incorporates an ultrasonic cleaning cycle in addition to a more conventional mechanical cleaning via bi-directional rotating microfiber cleaning drums, and the result is the cleanest LP's ever. Unlike other record cleaners the ultrasonic Vinyl Cleaner bursts millions of microscopic bubbles off the surface of the record all the way to the bottom of the groove, where no fiber is fine enough to reach. And among LP cleaners the Audio Desk System Vinyl Cleaner is unique in using filtered air for drying, rather than one of the static-inducing suction systems employed by other record cleaning machines. This vinyl record cleaner is fully automatic - just put the LP in the slot, push the button, and come back in 6 minutes (or tomorrow!) for a thoroughly cleaned and dried LP (both sides). Whole new layers of inner detail and air are revealed in the recordings, and of course most surface noise is eliminated. Pack of 4 of new replacement barrels for the Official Manufacturer's Part for the Audio Desk Systeme Vinyl Cleaner. This is replacemement barrels only for the Audio Desk Systeme Vinyl Cleaner. More information on the Audio Desk Systeme Vinyl Cleaner: LPs are precious: Not only for their excellent sound quality but in many cases as irreplaceable collector's items. Even when great care is taken, over time it becomes inevitable that they become dirty. This is replacemement barrels only for the Audio Desk Systeme Vinyl Cleaner. More information on the Audio Desk Systeme Vinyl Cleaner: Careful cleaning of discs is particularly important to preserve their value. Rainer Gläss from Audiodesksysteme has developed a professional yet comfortable LP-washing machine, the "Vinyl-Cleaner". The washing machine works fully automatically and is very easy to use. This is replacemement barrels only for the Audio Desk Systeme Vinyl Cleaner. More information on the Audio Desk Systeme Vinyl Cleaner: Counter-rotating micro-fibre cleaning barrels and ultrasonic waves softly remove even deep-sitting dirt particles from the grooves of the LP. When in operation the machine permanently filters the cleaning fluid. Two extremely high-performance motors guarantee effective yet quiet drying of the LP. If you have any questions about this product by Audio Desk Systeme, contact us by completing and submitting the form below. If you are looking for a specif part number, please include it with your message.